Forty-six nations, including the UK, have pledged to work towards a new treaty banning cluster bombs.At the end of a two-day conference in the Norwegian capital, Oslo, the countries signed a declaration committing themselves to a ban. They aim to prohibit by 2008 the use, production, transfer and stockpiling of cluster munitions that cause unacceptable harm to civilians. The US has rejected any ban, saying the weapons have a place in its arsenal. Negotiations toward a ban will now take place in a series of meetings over the next year. They will be held in Peru, Austria and Ireland. “We are now ready to move ahead towards an international ban on cluster munitions,” said Norway’s foreign minister Jonas Gahr Stoere. Campaigners had feared the UK, which has used cluster munitions in Kosovo and Iraq, would step back from committing itself to a new treaty by 2008. “The UK, which has used so many cluster bombs in the past, showed real leadership and agreed to join a fast-track process to negotiate a ban on cluster bombs that cause unacceptable harm to civilians,” said Simon Conway, director of the lobby group Landmine Action. Japan, Romania and Poland refused to sign up to the Oslo declaration. But key nations such as the United States, Russia and China did not attend the conference. US State Department spokesman Sean McCormack said: “We… take the position that these munitions do have a place and a use in military inventories, given the right technology as well as the proper rules of engagement”. He said the US military had made technical improvements to its own cluster bombs and looked closely at how they were used. Norway launched an initiative to push for a ban on cluster bombs last November, after some signatories to the UN Convention on Conventional Weapons (CCW) blocked a proposal to open negotiations to include the weapons. The convention seeks to protect military troops from inhumane injuries and prevent civilians from accidentally being wounded or killed by certain types of arms. Anti-cluster bomb campaigners claim they endanger civilians because they spread sub-munitions or “bomblets” over a wide area, increasing the risk of civilian casualties. The charity Handicap International estimates that 98% of those killed and injured by the weapons are non-combatants. They also say cluster bombs leave a large number of unexploded “duds” which continue to kill and maim long after a conflict has ended. But some military chiefs argue that cluster bombs are highly effective weapons, particularly for attacking moving targets. They claim banning them would put troops at a disadvantage on the battlefield and would require the use of alternative weapons which are likely to cause far more collateral damage. 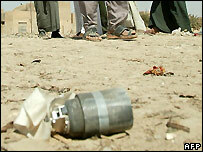 Campaigners say the Oslo conference marks a crucial first step towards bringing about an international ban on cluster bombs. They say it would stigmatise the weapons and put moral pressure on countries which do not sign up not to use them, as the Ottawa treaty outlawing the use of anti-personnel landmines has done. But without the support of key powers such as the US, Russia and China, says the BBC’s Stuart Hughes, the credibility of any new treaty remains open to debate. Did John Edwards risk the implosion of his 2008 presidential campaign by stating that Israel is the biggest threat to world peace? His staff just sent me an email rejecting the charge, a sure sign they are very worried it could spread. One of the most striking differences between the UK and US is the staunch backing here for Israel among Democrats and Republicans alike. Pro-Israel groups are highly influential. Many of the biggest US campaign contributors are Jewish-Americans in Manhattan and Hollywood. Unequivocal support for Israel is a virtual sine qua non for being elected nationally. Would Edwards be that foolish? What did he say? It’s not yet clear and even in this YouTube age, there might be no video clip because the offending words were allegedly uttered at a private event. If things were as they have been portrayed, then he’s in deep doo doo – even if it wasn’t exactly a Mel Gibson moment. In classic 21st Century fashion, the claim spread like wildfire via the Internet. First, it was buried in indirect speech and in the 5th paragraph of a Variety column. Peter Bart, the Variety columnist, referred to a fundraiser for Edwards held by Adam Venit, a partner at the agency Endeavor along with Ari Emanuel, a Barack Obama supporter whose brother Congressman Rahm Emanuel is a prominent Hillary Clinton ally (for now at least). Hollywood, you see, is divided over who to support in 2008 (this was the subject of the column). A few are even considering voting for – gasp – a Republican – most notably Rudy Giuliani, who is set to be endorsed by Brad Grey, of Sopranos fame. The Edwards campaign email, sent out within an hour or so of the item appearing on Drudge, stated that Variety “inaccurately quotes Senator John Edwards”. Of course, it didn’t quote him – it reported his speech. And accusing someone of misquoting is dangerous when you aren’t prepared to produce the real quote yourself. This may well not lay the matter to rest because it did not include Edwards’s words, which his staff presumably taped. I’m currently reading Paul Taylor’s superb “See How They Run”, about the 1988 US election campaign. In it, he reminds the reader of the old adage that you don’t issue a denial of a rumour or an erroneous story because that gives the press the hook to write about it. That that no longer holds true – partly because of the internet but also because the 1992 Clinton campaign “war room” and New Labour’s subsequent “rapid rebuttal unit” in the 1997 election showed that striking back swiftly and fiercely pays dividends. But to kill a rumour rather than give it more legs, the rebuttal needs to be comprehensive and persuasive. Has Edwards achieved that? Perhaps not. Lebanon’s military says it has fired anti-aircraft rounds against Israeli jet fighters violating its airspace. The aircraft were flying at low altitude over southern Lebanon, but none appear to have been hit. It is reported to be the first time the Lebanese military has fired at the Israeli aircraft, which make regular sorties over southern Lebanon. Beirut and the United Nations say the flights violate a ceasefire agreement sanctioned by the UN Security Council. Israel says the sorties are to make sure that weapons are not being smuggled into southern Lebanon to re-supply Hezbollah militants. The UN says the flights undermine the efforts of its peacekeepers to maintain stability in the area. Hezbollah and Israel fought a 34-day conflict in 2006, in which Israeli air power caused massive destruction to south Lebanon. Fighting ended in August under the terms of the UN ceasefire resolution. For the West, the crisis in Lebanon – where Hizbollah and its allies are still demanding the resignation of Fouad Siniora’s government – is getting more serious by the hour. Up to 20,000 UN troops – including Nato battalions of Spanish, French and Italian forces – are now billeted across the hillsides of southern Lebanon, in the very battleground upon which the Israelis and the Hizbollah are threatening to fight each other again. If Israel is America’s proxy (which the Lebanese don’t doubt), then Hizbollah is Iran’s proxy. The more the United States and Israel warn Iran of its supposed nuclear ambitions, the more Hizbollah increases the pressure on Lebanon. Already, there are dangerous signs of what may be to come. Spanish troops were stoned by youths in a Lebanese village last week. French soldiers who arrived at Maroun al-Ras with their weekly medical convoy for local Lebanese civilians were told in no uncertain terms that they were not welcome. The French left immediately. Was this because President Jacques Chirac, busy commemorating his murdered Lebanese friend Rafiq Hariri in Paris on Monday, is now talking of placing UN forces not just along the Lebanese border with Israel but along the country’s frontier with Syria as well? M. Chirac is warning that last summer’s war between the Hizbollah and Israel could “re-plunge Lebanon into a deep crisis”. If the Lebanese don’t pull themselves together, the French President added, they could “slide once more into a fatal chasm”. These are not words which are likely to commend themselves to President Assad or his opposite number in Tehran. Add to this the statement by Brigadier Yossi Baidatz, Israel’s head of research for military intelligence – disputed by Amir Peretz, the country’s Defence Minister – that the Hizbollah “is building up more firepower than it had before the war… some is still en route from Syria”, and it’s not difficult to see why a visiting delegation of Italian senators in Beirut have been expressing their fears for their own country’s UN troops in southern Lebanon. An Italian major general, Claudio Graziano, has just taken command of the multinational force, Unifil, and has been described by the Israelis as an expert in “counter-terrorism” – not quite the praise that General Graziano is likely to have wanted from the Israelis as he faces the dangers of the coming weeks and months. In fact, generals seem all the rage in Lebanon these days, the latest of whom – the Lebanese army commander General Michel Sulieman – has made a speech of remarkable common sense, effectively blaming Lebanon’s politicians for not creating the unity which might resolve its problems. In last month’s street fighting in Beirut and other towns, General Sulieman’s soldiers achieved the extraordinary feat of repeatedly breaking up riots without killing a single one of their own citizens. “Lebanon cannot be governed by its military or through a dictatorship,” he said. “It is a country satiated with democracy… but such a great amount of democracy in Lebanon might lead to chaos. Up to 70 per cent of the Lebanese army – which is now a volunteer, rather than a conscript force – are Shia, which is why it cannot be used to disarm the Shia Hizbollah. Shank: How is the political deadlock in Lebanon impacting the U.S. government’s decision to potentially go to war with Iran? Is there a relationship at all? Chomsky: There’s a relationship. I presume part of the reason for the U.S.-Israel invasion of Lebanon in July—and it is US-Israeli, the Lebanese are correct in calling it that—part of the reason I suppose was that Hezbollah is considered a deterrent to a potential U.S.-Israeli attack on Iran. It had a deterrent capacity, i.e. rockets. And the goal I presume was to wipe out the deterrent so as to free up the United States and Israel for an eventual attack on Iran. That’s at least part of the reason. The official reason given for the invasion can’t be taken seriously for a moment. That’s the capture of two Israeli soldiers and the killing of a couple others. For decades Israel has been capturing, and kidnapping Lebanese and Palestinian refugees on the high seas, from Cyprus to Lebanon, killing them in Lebanon, bringing them to Israel, holding them as hostages. It’s been going on for decades, has anybody called for an invasion of Israel? Of course Israel doesn’t want any competition in the region. But there’s no principled basis for the massive attack on Lebanon, which was horrendous. In fact, one of the last acts of the U.S.-Israeli invasion, right after the ceasefire was announced before it was implemented, was to saturate much of the south with cluster bombs. 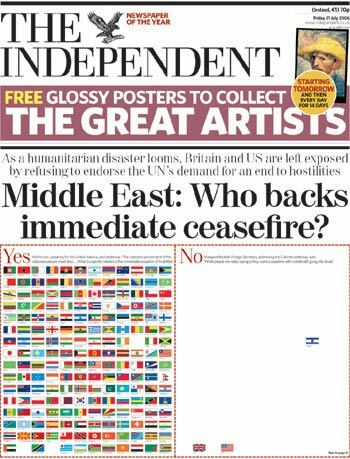 There’s no military purpose for that, the war was over, the ceasefire was coming. UN de-mining groups that are working there say that the scale is unprecedented. It’s much worse than any other place they’ve worked: Kosovo, Afghanistan, Iraq, anywhere. There are supposed to be about one million bomblets left there. A large percentage of them don’t explode until you pick them up, a child picks them up, or a farmer hits it with a hoe or something. So what it does basically is make the south uninhabitable until the mining teams, for which the United States and Israel don’t contribute, clean it up. This is arable land. It means that farmers can’t go back; it means that it may undermine a potential Hezbollah deterrent. They apparently have pretty much withdrawn from the south, according to the UN. You can’t mention Hezbollah in the U.S. media without putting in the context of “Iranian-supported Hezbollah.” That’s its name. Its name is Iranian-supported Hezbollah. It gets Iranian support. But you can mention Israel without saying US-supported Israel. So this is more tacit propaganda. The idea that Hezbollah is acting as an agent of Iran is very dubious. It’s not accepted by specialists on Iran or specialists on Hezbollah. But it’s the party line. Or sometimes you can put in Syria, i.e. “Syrian-supported Hezbollah,” but since Syria is of less interest now you have to emphasize Iranian support. When A Prime Minister has just lost a war, is dogged by corruption allegations and sees his popularity ratings in free fall – what can he do? Why, he can initiate provocations. A provocation diverts attention, generates headlines, creates the illusion of power, radiates a sense of leadership. But a provocation is a dangerous instrument. It can cause irreversible damage. PROVOCATION NO. 1: The northern frontier. Along the northern border runs a fence. But not everywhere does the fence coincide exactly with the recognized border (the so-called Blue Line). For topographical reasons, some sections of the fence run a few dozen meters south of it. That is the theory of the situation. In the course of the years, both sides have become accustomed to regarding the fence as the actual border. On the Lebanese side, the villagers farm the fields up to the fence, fields which may well be their property. Now Ehud Olmert has decided to exploit this situation and reveal himself as a great, invincible warrior. Some explosives recently found a few yards from the Blue Line serve as a pretext. The Israeli army claims that they were put there just days ago by Hizbullah fighters disguised as goatherds. According to Hizbullah, they are old bombs that have been there since before the recent war. Olmert sent soldiers beyond the fence to carry out a “Hissuf” (“exposure”) – one of those new Hebrew words invented by the army’s “verbal laundry” to beautify ugly things. It means the wholesale uprooting of trees, in order to improve vision and facilitate shooting. The army used the trademark weapon of the State of Israel: the armored bulldozer. The Lebanese army sent a warning that they would open fire. When this did not have any effect, they indeed fired several salvoes over the heads of the Israeli soldiers. 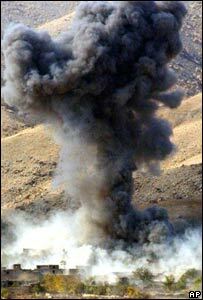 The Israeli army responded by firing several tank shells at the Lebanese position and lo – we have our “incident”. The whole affair is very reminiscent of Ariel Sharon’s methods in the 60s, when he was the chief of operations of the Northern Command. Sharon became quite an expert at provoking the Syrian army in the demilitarized zones that existed on the border between the two countries at the time. Israel claimed sovereignty over these areas, while the Syrians asserted that it was a neutral zone that did not belong to either state and in which the Arab farmers, who owned the land, were allowed to tend their fields. According to legend, the Syrians exploited their control of heights overlooking the Israeli villages in the valley below them. Again and again the evil Syrians (the Syrians were always “evil”) terrorized the helpless kibbutzim by shelling. This myth, which was believed by practically all Israelis at the time, served as a justification for the occupation of the Golan Heights and their annexation by Israel. Even now, foreign visitors are brought to an observation post on the Golan Heights and shown the defenseless Kibbutzim down below. The truth, which has been exposed since then, was a bit different: Sharon used to instruct the Kibbutzniks to go to their shelters, and then send an armored tractor into the demilitarized zone. Predictably, the Syrians shot at it. The Israeli artillery, just waiting for its cue, then opened up a massive bombardment of the Syrian positions. There were dozens of such “incidents”. Now the same method is being practiced by Sharon’s successor. Soldiers and bulldozers enter the area, the Lebanese shoot, the Israeli tanks shell them. So what is the aim of this provocation? The same as with all Olmert’s recent actions: gaining popularity to survive in power, in this case by creating tension. PROVOCATION NO. 2: The Temple Mount. Islam has three holy cities: Mecca, Medina and Jerusalem. In Mecca this week, the chiefs of Fatah and Hamas assembled in order to put an end to the mutual killing and set up a unity government. While the attention of the concerned Palestinian public was riveted there, Olmert struck in Jerusalem. As pretext served the “Mugrabi Gate”, an entrance to the Haram-al-Sharif (“the Noble Sanctuary”), the wide plaza where the al-Aqsa mosque and the Dome of the Rock are located. Since this gate is higher than the Western Wall area below it, one can approach it only over a rising bridge or ramp. The old bridge collapsed some time ago, and was replaced with a temporary structure. Now the “Israel Antiquities Authority” is destroying the temporary bridge and putting in its place – so it says – a permanent one. But the work looks much more extensive. As could have been expected, riots broke out at once. In 1967, Israel formally annexed this area and claimed sovereignty over the entire Temple Mount. The Arabs (and the whole world) have never recognized the annexation. In practice, the Temple Mount is governed by the Islamic Waqf (religious endowment). The Israeli government argues that the bridge is separate from the Temple Mount. The Muslims insist that the bridge is a part of it. Behind this tussle, there is a lurking Arab suspicion that the installation of the new bridge is just a cover for something else happening below the surface. At the 2000 Camp David conference, the Israeli side made a weird-sounding proposal: to leave the area itself to the Muslims, but with Israeli sovereignty over everything beneath the surface. That reinforced the Muslim belief that the Israelis intended to dig beneath the Mount, in order to discover traces of the Jewish Temple that was destroyed by the Romans 1936 years ago. Some believed that the real intention was to cause the Islamic shrines to collapse, so a new Temple could be built in their place. These suspicions are nurtured by the fact that most Israeli archaeologists have always been the loyal foot-soldiers of the official propaganda. Since the emergence of modern Zionism, they have been engaged in a desperate endeavor to “find” archaeological evidence for the historical truth of the stories of the Old Testament. Until now, they have gone empty-handed: there exists no archaeological proof for the exodus from Egypt, the conquest of Canaan and the kingdoms of Saul, David and Solomon. But in their eagerness to prove the unprovable (because in the opinion of the vast majority of archaeologists and historians outside Israel – and also some in Israel – the Old Testament stories are but sacred myths), the archaeologists have destroyed many strata of other periods. But that is not the most important side of the present affair. One can argue to the end of days about the responsibility for the Mugrabi walkway or what it might be that the archaeologists are looking for. But it is impossible to doubt that this is a provocation: it was carried out like a surprise military operation, without consultation with the other side. Nobody knew better what to expect than Olmert, who, as mayor of Jerusalem, was responsible for the killing of 85 human beings – 69 Palestinians and 16 Israelis – in a similar provocation, when he “opened” a tunnel near the Temple Mount. And everybody remembers, of course, that the Second Intifada started with the provocative “visit” to the Temple Mount by Ariel Sharon. This is a provocation against 1.3 billion Muslims, and especially against the Arab world. It is a knife in the back of the “moderate” Mahmoud Abbas, with whom Olmert pretends to be ready to have a “dialogue” – and this at exactly the moment Abbas reached an historical agreement with Hamas for the formation of a national unity government. It is also a knife in the back of the king of Jordan, Israel’s ally, who sees himself as the traditional protector of the Temple Mount. What for? To prove that Olmert is a strong leader, the hero of the Temple Mount, the defender of the national values, who doesn’t give a damn for world public opinion. * * *PROVOCATION NO. 3. After Haim Ramon was convicted of indecent conduct, the post of the Minister of Justice fell vacant. In a surprise blow, after laying down a smoke screen by dangling the names of acceptable candidates, Olmert appointed to the post a professor who is the open and vocal enemy of the Supreme Court and the Attorney General. The Supreme Court is almost the only governmental institution in Israel which still enjoys the confidence of the great majority. The last President of the Court, Aharon Barak, once told me: “We have no troops. Our power is based solely on the confidence of the public.” Now Olmert has appointed a Minister of Justice who has been engaged for a long time and with a lot of noise in destroying this confidence. Indeed, it seems that this is his main interest in life, ever since he failed to get a close friend, a female professor, elevated to the Supreme Court. One can see in this an effort by Olmert, a politician who is dragging behind him a long train of corruption affairs (several of which are at present under police and State Comptroller investigation), to undermine the investigators, the Attorney General and the courts. It serves also as revenge against the court that dared to convict Ramon, his friend and ally. He did not, of course, consult with anyone in the judicial system: not with the Attorney General (whose official title is “Legal Adviser of the Government”) nor with the President of the Supreme Court, Dorit Beinish, whom he cannot stand. I am not an unreserved admirer of the Supreme Court. It is a wheel in the machinery of the occupation. It cannot be relied on in matters like the targeted assassinations, the Separation Wall, the demolition of Palestinian homes and the hundred and one other cases over which the false banner of “security” is waving. But it is the last bastion of human rights inside Israel proper. The appointment of the new minister is an assault on Israeli democracy, and therefore no less dangerous than the other two provocations. * * *WHAT DO the three have in common? First of all: their unilateral character. Forty years of occupation have created an occupation mentality that destroys all desire and all ability to solve problems by mutual understanding, dialogue and compromise. Both in foreign and domestic relations, Mafia methods reign: violence, sudden blows, targeted eliminations. When these methods are applied by a politician haunted by corruption affairs, an uninhibited war-monger who is fighting for survival by all means available – this is indeed a very dangerous situation.